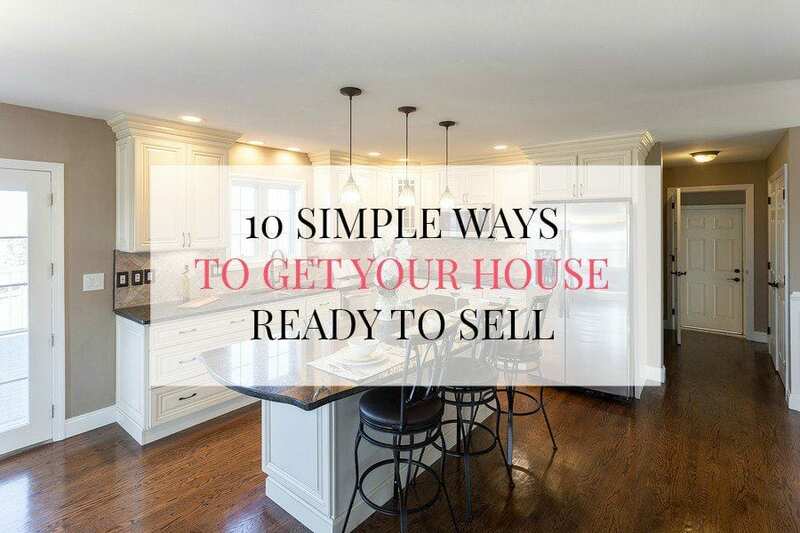 Are you looking for simple ways to get your house ready to sell? Here are a few things we did that I believe made a difference in how potential buyers saw and felt about our home. The last couple of months has been all about getting our house ready to sell. We put it on the market at the end of March and if all goes well, we’ll close in early May. We live in a hot market right now and houses are going fast, but I believe we also did some key things to get it ready, which brought in offers the first day and around 20 showings total. Needless to say, I’m very happy to be out of the ‘showings’ phase! 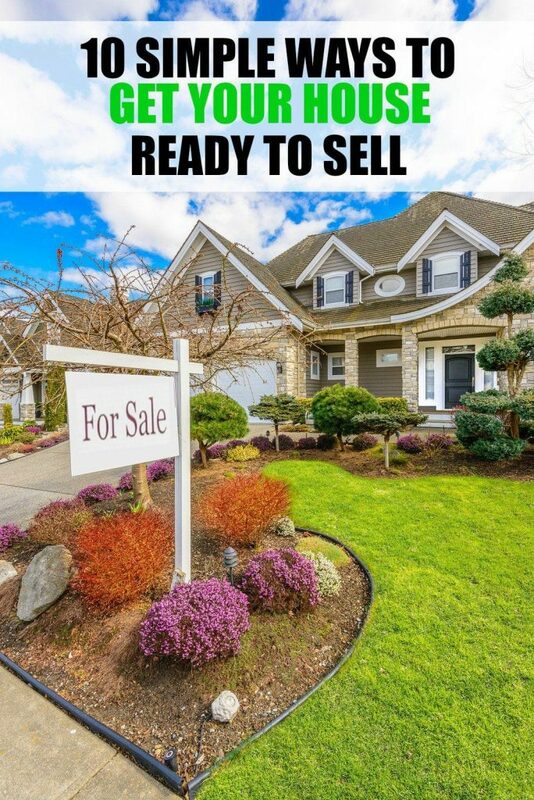 If you’ve ever sold a house or worked in real estate, then you know how much work getting a house ready to sell is. It might be a lot of work, but the payoff is well worth it. It’s almost impossible to clean what needs to be cleaned and really show off what your house has to offer with clutter in the way. It distracts the eye from your home’s best features, as well as makes cleaning harder on yourself. So the first thing we did was a major declutter. If your home is very cluttered and this step overwhelms you, the easiest way to go about this is step by step. Knowing how to sort through the clutter and what process to follow will help you with the overwhelm. We took many trips to a donation drop-off center, had a garage sale and also boxed up anything we wanted to keep but didn’t want to be displayed. Floors are a really big deal to home buyers and you want them to look as best as possible. That can mean anything from replacing carpets to getting them professionally cleaned. We ended up replacing the carpet downstairs and giving the carpets upstairs a deep clean. Our tile in the kitchen and bathrooms were given a good scrubbing. The simplest way to get your floors ready is to hire someone else to do it. We’ve done this before and it was money well spent. Our house is only four years old, so the paint is in good condition. If you’ve painted your house in the last few years or your house is fairly new, most likely the paint will only need touch ups. We were able to get an exact match of the interior paint and after going over scuff marks and everyday wear and tear, the walls looked great. Be sure to check all doors and exterior paint as well. Your yard is the first impression when potential buyers drive up for a showing or are casually driving through a neighborhood looking at houses for sale. The simplest ways to get it looking good are to mow and weed eat, lay down any fresh mulch and add some color with fresh flowers in pots. Clearing off the clutter on the kitchen counters, bathroom sinks, dressers, and desks made such a difference in the way our house looked. I loved it so much it made me wish we had done this sooner for ourselves to enjoy! I noticed that our kitchen and bathrooms looked so much bigger and brighter after doing this one simple task. The real estate company we used included someone to stage our house for us, which was really nice. She helped us change up the flow of the furniture in the living room and master bedroom, to make it a little more inviting to potential buyers. She also brought in more lamps for maximum lighting and a few decorative items that pulled from the colors I already decorated with. 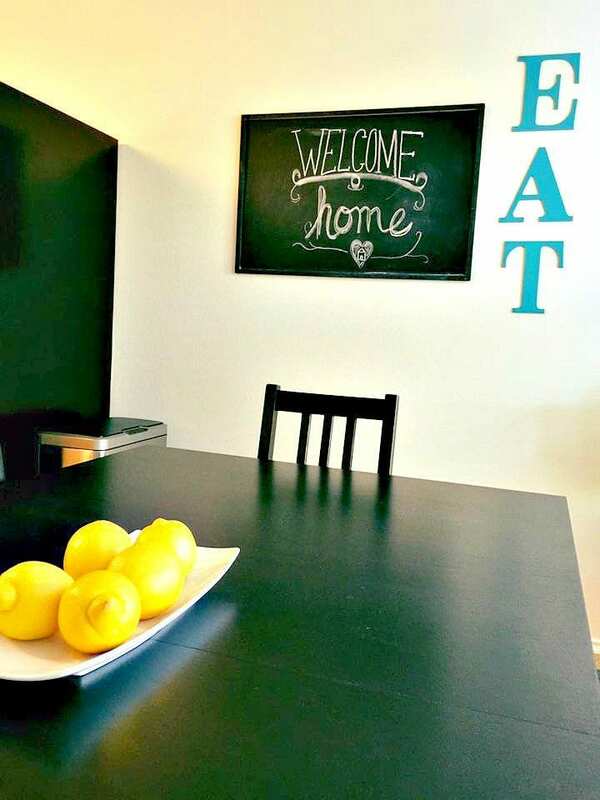 We also added some homey touches like bright yellow lemons and a ‘Welcome Home’ sign on our chalkboard. To do this yourself, look at your home through the eyes of a buyer. What are your home’s best features? What made you purchase the house in the first place? Highlight these features in the best way possible so they really wow visitors. Another tip is to flip through home decor magazines, as well as scroll through other house listings to see what staging elements they have. The last thing you want is to leave dirty towels out. Some show dirt easily and often has a musty odor if they’ve been used and hanging for awhile. We set aside brand new towels to display for showings in the bathrooms and kitchen. You could always go with bright white towels or if your bathroom lacks excitement, add some towels with a nice punch of color. It’s amazing how much bigger our closets looked after we removed items from the floor. We mainly did this in the pantry and linen closets. This was probably one of the hardest things to keep up with. It’s amazing how fast dishes can stack up. Fast enough to make me want to eat out every day, but since that wasn’t happening, we used as little dishes as possible. We also hand washed and dried small loads so we could immediately put them away. This not only helped our home always smell fresh, but it made less work for us to do when we had a quick showing and had to leave. After we cleaned the kitchen, we would wipe down all of the counters, appliances and dining room table. We did the same thing in the bathrooms after getting ready in the morning. Going through the process of selling and showing a house can definitely be stressful. 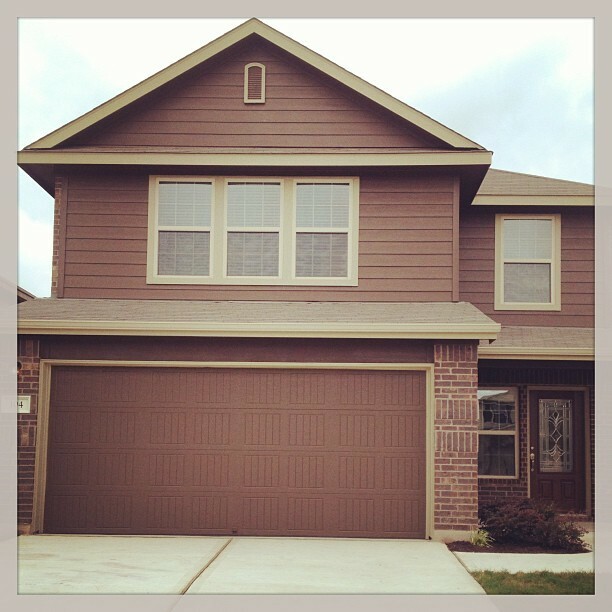 But through it all, we kept reminding ourselves (and our kids) what the big picture was: getting the house sold! I believe these short-term inconveniences were well worth it in the end. Do you have any tips for simple ways to get your house ready to sell?